Schalke defender Naldo is set to become the Brazilian with the highest numver of game in Bundesliga. We could remember Naldo made his first Bundesliga appearance with Weder Bremen on 5 August 2005. Since then Naldo has played for Bremen, Wolfsburg and Schalke and now he is set to break Ze Roberto's record of most games in Bundesliga as a Brazilian. During an interview after Naldo sign his new contract, Schalke sporting director Christian Heidel has some word of praises for the Brazilian. He said: "Naldo is a leader. He lives for the value of this club and impresses on the pitch. Inside the dressing - room he is highly trusted and respected by his teammates because of his positive and constructive attitude." After signing the contract, Naldo said he hopes to play longer for Schalke. 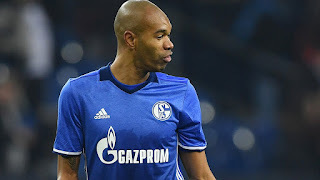 Naldo said: "I hope to be able to play for Schalke even longer than 2019, but whatever the case, i'm not thinking about quitting yet," he told German publication Bild recently. "Personally, I feel very good; I'm pleased that I can contribute to (our recent) success,"